By his early 20s, Laura Ellington’s son had exhausted the typical options for people with a mental illness: short-term hospital stays, a day program, medications, psychiatric sessions, group and individual therapy. Nothing helped him live productively with bipolar disorder and achieve his goal of returning to college. For a while, her son’s depression was so paralyzing Ellington had to rouse him from bed just to eat. Then she discovered CooperRiis, a private, nonprofit therapeutic farm community in Polk County for adults with mental illness. On 80 peaceful, hilly acres with a pond and barnyard animals, Ellington’s son found what he needed: structure, the purpose that work provides, coping skills, good nutrition, and exercise. Some observers call it the best treatment and recovery model in the nation. The first time Ellington visited her son at CooperRiis, they dug a trench together and planted asparagus, which eventually was served in the dining hall. “The whole interconnectedness of planting, harvesting, eating, of really contributing to the community—it was a powerful experience,” says Ellington of Landrum, South Carolina “Mental illness is isolating, and there’s uncertainty about where you fit in the world. The concept of the healing farm brings back that connectedness that’s missing.” As part of the life-skills program at the center, residents work in jobs such as cooking, farming, gardening, and housekeeping. Ellington’s son grew poinsettias, tended crops, cared for animals, and did some woodworking. After spending about eight months at CooperRiis in 2005 and ’06, he returned to college and graduated this spring from Western Carolina University. Now 26, he has an internship with a professional sports team and lives independently. The job program, frequent psychotherapy sessions, and a full-time addictions counselor distinguish CooperRiis from other treatment options and are all tied to the center’s focus on recovery, or helping people live as productively as possible. As North Carolina officials address understaffing and other challenges with the state’s mental health system, advocates for people with mental illnesses say programs such as CooperRiis provide an enlightening alternative. The model this program is based upon started in 1913 at Gould Farm in Massachusetts. About 90 years later, the Polk County center is the only such community in the Southeast and among just a dozen in the nation. To meet the need for mental health services, administrators plan to open a second campus in Asheville in early 2010 to accommodate as many as 24 residents. “There’s no doubt that the weakness of the public services is what’s creating such high demand for us,” says Don Cooper. 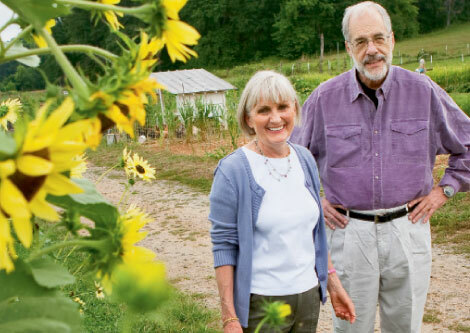 He and his wife, Lisbeth Riis Cooper, opened this facility in 2003, when they became frustrated by inadequate services they found for a family member with mental illness. For many fruitless years, the Rutherford County couple saw their relative experience it all: at state hospitals, homeless, in shackles, living in homes with other mentally ill, and at a community similar to CooperRiis. They resolved to create an alternative and raised $10 million to build the facility at a former horse farm. Lisbeth was retired from the fashion industry. Don was near retirement from an insurance career. “Giving something back to life was attractive to me. There was a philanthropic motivation here,” he says. “Our effort is to show a better way. Society’s way of dealing with mental illness is cycling people in and out of hospitals,” says Don, chairman of the board of directors. The aims of CooperRiis are “to give people with mental illness hope, to help them move toward being fully functioning to the limits of their capabilities, and to treat them humanely,” he says. According to many, the community is reaching that mark. “It’s what I consider to be the premier place for treatment in the country. I feel like this is definitely the right approach to take,” says Bob Swoap, chairman of Warren Wilson College’s psychology department, who conducted research at CooperRiis. “They’re using a holistic approach but also incorporating it with state-of-the-art treatment, using the best of what we know about psychiatry, clinical psychology, group therapy, and substance abuse treatment.” The prevailing psychiatric approach for people with mental illness focuses on medications to manage symptoms. “Medication has its role,” says Swoap, but at CooperRiis, “You’re looking for residents to grow and change and not just treating symptoms.” Visitors who imagine a stereotypical mental institution—images from author Ken Kesey’s One Flew Over the Cuckoo’s Nest may come to mind—will be surprised by CooperRiis. The environment has the feel of a school or camp. There’s a yoga room, drum circle, and labyrinth for meditation. The art barn houses a kiln, pottery wheels, and a theater area. The woodworking shop has djembe drums, flutes, and canoes, and an area where residents spin and dye wool from the sheep. The farm accommodates 36 residents, and about 40 staff members who live here, too. The average stay is six to nine months. Residents’ most common diagnoses are major depression, schizophrenia, bipolar disorder, and personality disorders. After leaving the farm, about half the residents choose to move to housing owned or overseen by CooperRiis in the larger community, with varied levels of staff support and independence. Here, the sense of interaction is key. “Residents feel like they’re able to give back and not just be seen as patients, but as contributing members of a community. The community itself is the real healing factor,” Swoap says. “People thrive when they’re in a relationship with other people. It’s the relationships here and the connections we all make with one another,” says Lisa Schactman, the life-skills program manager, whose family lives on the farm. But balance is important. “The fine line that I think you walk—in a community like that—is that the question of boundaries always has to be clarified,” says Dr. Pamela Lowe, a psychiatrist based in Hendersonville and former consulting psychiatrist at CooperRiis. “When the client and the staff are so close together, where are the lines? I think they do that well, but it’s hard work.” The environment was therapeutic for Dan Gaffney, a former resident at CooperRiis with bipolar disorder. Gaffney, 51, a dentist in the Hickory area, attributes his success at the farm mainly to regular counseling and the life-skills program. While there, it was his responsibility to make lunch and dinner for the community. But he gained more than cooking skills. “I came away feeling like a competent man,” he says. That’s an important attribute, because far from instilling competence, public mental hospitals across the country often foster dependency. That unintended side effect—coupled with improved psychiatric medications that help people function at a higher level—were large factors in the closure of hospitals from the 1970s through the ’90s. The aim was shorter stays at hospitals and then treating people closer to home in private programs. Most such programs in North Carolina “were just inadequately prepared for what was being asked of them,” says Jim Pitts of Asheville, president of the National Alliance on Mental Illness-North Carolina. State officials “could do much, much better in allowing state mental hospitals to pay attention to each individual, to keep them for as long as the medical people think appropriate and to hand them off to other people with adequate resources at local levels.” It takes resources to stay at CooperRiis, where the monthly fee is $12,500. About half of the residents receive scholarships, available after the first two months. The cost “makes it a model not available to most of the people that need it,” Lowe says. But that doesn’t make the program less viable. “The public mental health system could spend some of its money differently and perhaps fund a similar model.” Some state mental health officials have taken note of CooperRiis. “They seem to work really hard on getting folks rehabilitated and back in the community in an independent setting if possible,” says Jeff Horton, acting director of the state Division of Health Service Regulation. “If you can get somebody to the point where they can live in the community and have a productive life, and they don’t have to go back to an inpatient setting, that’s a big milestone.” But the state’s mental health caseload of a couple hundred thousand people dwarfs the number CooperRiis can accommodate. “I don’t think the public sector could completely replicate the CooperRiis model. What we do try to do is take that direct-service delivery and some of that philosophy about the value of work and build that into our local mental health services,” says Leza Wainwright, director of the state Division of Mental Health, Developmental Disabilities and Substance Abuse Services. “Most folks we’re serving in the public sector can’t afford the disconnect from jobs and family for that period of time,” Wainwright explains. “And they can’t really afford the out-of-pocket expense of a place like CooperRiis.” Despite the cost, CooperRiis is usually full, but the community isn’t for everyone, Don admits. Some people don’t like it and leave. Residents have been hospitalized for purposely injuring themselves. Others have been asked to leave for repeatedly failing to observe rules. Compared with other options, however, CooperRiis is “much more optimistic about the power of community in supporting people to return to a fruitful life,” Pitts says. “There’s still a very strong belief in the public and among some mental health professionals that mental illness is an unchangeable condition, and once you have it you’re stuck and cannot return to the hustle and bustle of everyday life, to family relationships, to holding a job.” Some former CooperRiis residents have defied that belief. “There are many young people who are back in college or living and working independently who are examples of the fact that mental illness doesn’t have to be permanently disabling,” Lowe says. “CooperRiis has helped people realize their hope for a life with mental illness.” Somewhere in the meaningful work and connection to people, Ellington’s son found hope. “We went through some dark times,” she says. “I think I always knew we would get through it with him, but I didn’t know the way. I think CooperRiis showed us.” Revised: Date of Asheville CooperRiis facility opening changed to early 2010. Per month fee corrected.